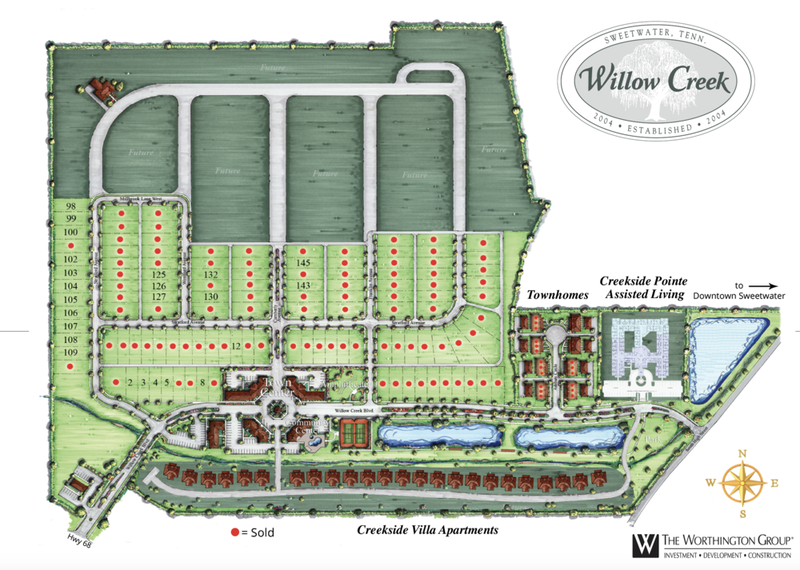 Located in the quaint town of Sweetwater, Willow Creek is an exclusive lifestyle community established in 2004. Sweetwater is nestled in the valley of the mountains of East Tennessee and centered with thriving Knoxville only thirty minutes north, Watts Bar lake twenty minutes west, The Cherohala Skyway thirty minutes east, and Chattanooga less than an hour south. Willow Creek, steps from downtown Sweetwater, was designed and built by Jeff and Joleen Darragh, husband and wife contractor/developer, architecture team. The only all inclusive neighborhood like it in its town, Willow Creek, features traditional residences in a wide variety of styles, along with handy amenities like an exercise facility, pools, playground, tennis courts, outdoor amphitheater, community center, and miles of landscaped sidewalks. Willow Creek is more than just a housing complex – it's a neighborhood, and any good neighborhood comes with amenities for the locals. When we built Willow Creek, we handpicked fine comforts to create our community such as miles of sidewalks, an outdoor amphitheater, tennis courts, gazebo, swimming pools, fitness center, and community center. We are constantly looking for like-minded people to join our team. If you are interested in investment, development, or general contracting, please let us know.